G B M Co No 3 (1964) The 65 foot wooden gas screw freight vessel G B M Co No 3 was destroyed by the earthquake tidal wave of March 27, 1964 at Kodiak. G P C 19 (1956) The 12 ton 31 foot wooden gas screw fishing vessel G P C 19 was consumed by fire October 8, 1956 on the Standard Oil Float at Kodiak. G P C 20 (1967) The 31 foot wooden gas screw fishing vessel G P C 20 was destroyed by a storm November 23, 1967 at Ouzinkie. G P C 21 (1965) The 15 ton 34 foot wooden gas screw fishing vessel G P C 21 was destroyed by a storm October 10, 1965 at Ouzinkie. G P HUDSON (1914) The G P Hudson was reported lost in Chignik Bay in 1914. 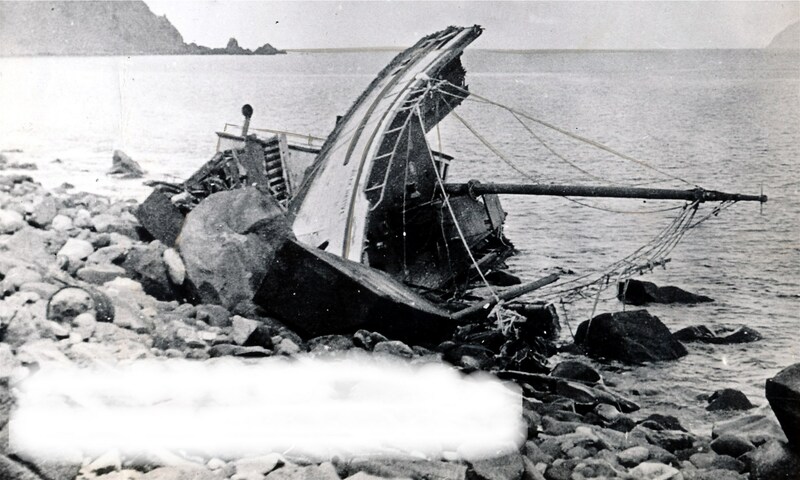 G R F (1941) The 28 ton 46 foot wooden scow G R F stranded and was lost on Karluk Beach June 15, 1941. No one was aboard and no lives were lost. GAIL S (1997) The 80 foot tug Gail S flooded, rolled over and sank while towing a 240 foot barge August 13, 1997 in Bristol Bay 130 nautical miles north of Cold Bay. Four crewmembers were rescued and one was lost in the disaster. The barge was salvaged still tethered to the sunken Gail S.
GALE (1977) The 34 foot vessel Gale sank September 25, 1977 in Malina Bay. The Gay Head left San Francisco on a whaling voyage October 4, 1913 with a crew of 31. They had accumulated 120 tons of sperm oil worth $4,787. They departed Chignik June 26, 1914 and wrecked the following day. The Gay Head was valued at $20,000 at the time of the casualty. All crewmen survived. GAY LADY (1964) The 11 ton 30 foot wooden gas screw fishing vessel Gay Lady collided with a submerged object and was lost July 21, 1964 in Prince William Sound. GEM (1981) The 47 foot fishing vessel Gem struck a rock and sank October 30, 1981 near Cape Spencer. Three of her four crewmen were rescued from the beach after being found by a U S Coast Guard C-130. A fourth crewman, Tim Blake, was lost. GENE (1942) The 8 ton 32 foot wooden gas screw Gene stranded and was lost at Rye Island in September of 1942. GENEI MARU NO 7 (2002) The 97 foot Japanese squid fishing catcher processor Genei Maru No 7 caught fire and was abandoned May 27, 2002 in the international waters of the north Pacific. The abandoned vessel drifted ashore November 10, 2002 at Kazakof Bay on Afognak Island. All recoverable fuel, miscellaneous oils, hazardous materials and plastics were removed from the derelict vessel. Salvage and disposal of the hull was under consideration. GENERAL MILLER (1882) The 108 ton two masted schooner General Miller was wrecked in the Shumagin Islands in 1882. Her value at the time of the casualty was $15,000 with cargo. GENERAL PERSHING (1964) The 44 ton 59 foot wooden oil screw fishing vessel General Pershing was destroyed by a storm July 23, 1964 near Valdez about four miles southeast of Glacier Island. GENERAL SIGLIN (1902) The 80 foot 81 ton two masted schooner General Siglin was lost off of False Pass October 3, 1902 along with her crew of eight. She was traveling from Nome to Puget Sound with a scheduled stop at Dutch Harbor. She was last seen outside the entrance to False Pass, but never made it to Dutch Harbor. Lost were owners John Murray of Seattle and John McKay of Chicago, captain Oscar Bartel, Julius Lorain, Gustav Meuler, Alex McAllister along with two others. GEORGE H (1957) The 11 ton 37 foot wooden gas screw fishing vessel George H burned August 11, 1957 at Wide Bay. GEORGE W (1988) The 58 foot trawler George W disappeared with all hands March 17, 1988. She was last seen in Uyak Bay on Kodiak Island with three crewmen aboard. Two bodies were found by the fishing vessel Nomad two days later in a life raft near Sutwik Island 30 miles east of Chignik. Lost were owner operator James Michael Miller (37), David Meersand (32) and Theodore O’Leary (27), all from Kodiak. GERTRUDE ANN (1978) The fishing vessel Gertrude Ann capsized and was lost September 18, 1978 near Sitkinak Island. GERTRUDE ANN (1980) The vessel Gertrude Ann sank October 26, 1980 near Afognak Island. GERTRUDE S (1976) The 70 foot vessel Gertrude S sank September 23, 1976 in Kupreanof Strait in 57 fathoms of water. The crew was picked up by the fishing vessel Sierra Seas. GF 8 (1954) The 8 ton 27 foot wooden gas screw fishing vessel GF 8 stranded and was lost July 9, 1954 two miles north of Middle Bluff. GGSY#4 (1918) The 29 ton wooden scow GGSY#4 foundered in a heavy gale 140 miles west of Cape Spencer Wednesday May 13, 1918. There were no passengers or crew lost. The vessel had departed from Ketchikan March 9th bound for Latouche. It was 4:30 a.m. with winds at 60 mph and thick snow when the casualty occurred. GIRDWOOD RANGER (1983) The sailboat Girdwood Ranger sank in heavy weather May 30, 1983 south of Cordova. GJOA (1920) Nine crewmen were on the beach and only the master aboard the 20 ton wood gas screw Gjoa when the anchor cable parted in a SE storm at 8:00 a.m. Wednesday August 4, 1920 34 miles east of Cape Suckling. The Gjoa stranded and was lost with 2.5 tons of salvage equipment aboard. Captain Hans Keil and his crew survived. GLACIER QUEEN (1978) The fishing vessel Glacier Queen sank March 19, 1978 at Hinchinbrook Entrance off of Zaikof Point near Schooner Rock. The crew was rescued by the fishing vessel Lone Fisherman. GLACIER QUEEN (1979) The barge Glacier Queen was towed to deep water and scuttled January 19, 1979 at an old military dump site west of Cape Saint Elias in 2,000 fathoms of water. The vessel had been lying on the bottom of Seldovia Bay since November of 1978. After many weather delays, she was refloated and towed to her grave by the vessel Salvage Chief. The Gladiator, valued at $5,000 was a total loss as was her cargo. There was no insurance. GLADYS M (1993) The 33 foot longline halibut fishing vessel Gladys M flooded, capsized and sank June 12, 1993 in Cook Inlet northeast of Augustine Island. All four crewmembers were rescued. GLEN (1907) The 107 foot 127 ton wooden codfishing schooner Glen stranded in a heavy NE gale when her anchor cables parted at East Anchor Cove on Unimak Island at 7:30 p.m. Monday September 30, 1907. The Glen departed San Francisco August 25 of that year with a crew of eight and had stowed about 85 tons or 28,000 codfish when the casualty occurred. One crewman, a teenage boy named Burton Kelly was lost. Weather at the time was reported to be a NE hurricane force gale, overcast, cloudy with heavy seas. When the accident report was filed in San Francisco by a secretary for the owners, the Glen was high and dry and some of her cargo had been removed. Vessel Value was listed at $6,000 with damage somewhere between $2,000 and $6,000 depending on whether she could be salvaged. The report also states that only $1,700 of her $7,000 worth of codfish was lost. Insurance on the vessel was listed at $3,000 and cargo at $1,504. The John F Miller was reported wrecked January 8, 1908 trying to salvage the Glen. GLENDA RAE (1955) The 11 ton 29 foot wooden gas screw fishing vessel Glenda Rae foundered October 27, 1955 at Rocky Bay near Seldovia. GLORY BE (1971) The cabin cruiser Glory Be caught fire and exploded August 21, 1971 In Resurrection Bay. GO GET (1930) The 29 ton wooden gas screw Go Get caught fire and was destroyed at the dock at Kukak Bay Cannery at 2 a.m. August 13, 1930. The crew of four escaped but the Go Get, valued at $4,000 was lost. John Fraser, J A Kelton and other cannery crew assisted in the effort to put out the blaze using fire extinguishers and water but the Go Get became a total loss beyond repair. GOD’S WILL (1999) The 85 foot trawler God’s Will sank 15 miles southwest Cold Bay while traveling between False Pass and King Cove October 21, 1999. Crewman Rick Edgemond (29) of Idaho was rescued from a life raft by U S Coast Guard helicopter from Cold Bay. Edgemond was transporting the vessel to King Cove to effect repairs. An electrical fire had damaged the God’s Will on October 18th. GOLD N SUN (1986) The 127 foot fishing vessel Gold N Sun sank April 15, 1986 approximately 15 miles northwest of Cape Sarichef, near Unimak Pass. All six crewmen aboard were rescued. The Golden Forest, valued at $300,000 was a total loss as was her cargo. The vessel can still be seen on the rocks slowly rusting away at Cape Ilktugitak on the west side of the Shelikof Straits. Insurance was unknown by the master at the time of this casualty report but another report was filed in San Francisco in October by the owners. GOLDEN GIRLS (2007) The 42 foot salmon seiner Golden Girls capsized and sank August 20, 2007 in Ugak Bay. The vessel was attempting to haul a large number of fish aboard. All four crewmembers were able to escape to a skiff and were picked up by the fishing vessel Chiniak. The sunken vessel was later cut up and taken away by her owner. GOLDEN PRIDE (1987) The 83 foot trawler Golden Pride capsized and sank September 19, 1987 in Unimak Pass. Rough weather was said to have contributed to the disaster. The vessel’s four crewmembers escaped to a life raft and were rescued by another fishing vessel five hours later. GOLDEN PROVIDER (1984) The 78 foot fishing vessel Golden Provider sank August 14, 1984 in Bristol Bay, 65 miles northwest of Port Heiden. All four persons aboard were picked up from their life raft by the fishing vessel Smaragd. GOLDHUNTER (1881) The 8.1 ton schooner Goldhunter lost her rudder in a storm and was driven ashore “about 30 miles east of entrance of Behrings Bay” Saturday April 2, 1881. Aboard were James Hollywood of Sitka, his wife Anna, their two young daughters and three other crewmen. They survived the casualty but the Goldhunter, valued at $800 was a total loss with no insurance. GOOD NEWS (2009) The vessel Good News went aground and was destroyed November 8, 2010 between Afognak and Marmot Islands. GOOSE (1948) The 12 ton 33 foot wooden gas screw fishing vessel Goose stranded and was lost September 5, 1948 23 miles west of Cape Spencer. GRANNY ROSA (1992) The 51 foot salmon seiner Granny Rosa capsized and sank February 29, 1992 in the Prince William Sound Traffic Lane north of Bligh Island and west of Busby Island. All four crewmembers were rescued. GRAVINA POINT (1947) The 59 ton 71 foot wooden gas screw fishing vessel Gravina Point burned August 11, 1947 at Cordova. GRAY FOX (1989) The 36 foot fishing vessel Gray Fox burned and sank August 12, 1989 between Ugak Island and Narrow Cape. All those on board were rescued. GRIZZLE N (1970) The oil screw Grizzle N foundered and was lost August 13, 1970 in Kachemak Bay. GRIZZLY (1922) The 28 ton wooden gas screw Grizzly was driven onto the beach to avoid loss of life at noon November 12, 1922 in Jute Bay in the Shelikof Strait. The Grizzly was on her way from Kodiak to Kanatak loaded with 29 tons of lumber when she began icing heavily and then sprung a leak. The crew of four was captained by Walter Johnson of Kodiak. The weather at the time was said to be heavy seas, freezing weather, heavy SW wind, dark, no moon and thick. The Grizzly, worth $12,000 and her cargo were reported as total losses. GROM (1996) The 39 foot salmon gillnet fishing vessel Grom grounded and became a total loss September 24, 1996 in Shelter Bay, Prince William Sound. GULF KING (1964) The 11 ton 32 foot wooden gas screw fishing vessel Gulf King was destroyed by a tidal wave March 27, 1964 at Valdez. GUNNER (1920) The gas screw whaling boat Gunner was lost in Prince William Sound in 1920 when a whale gun exploded. The Gunner was used to secure whale meat for fox farmers. GUY JUNIOR (1961) The 50 ton 58 foot wooden oil screw fishing vessel Guy Junior foundered in October of 1961 off of Montague Island. GYPSY (1964) The 57 ton 70 foot wooden oil screw passenger vessel Gypsy was destroyed by a tidal wave March 27, 1964 at Valdez. GYPSY (1996) The 33 foot vessel Gypsy sank September 27, 1996 in Marmot Bay. The two persons on board made it to safety. GYRO JUMBO (1971) The fishing vessel Gyro Jumbo sank In a storm May 31, 1971 on the Copper River Delta. One crewmember was lost.